It was raining all last night and is raining now. In between it was fog with intermittent semi-clearing. Late in the afternoon the sun made a few feeble attempts to light up the ridge across the valley. It was all lovely and even more lovely to be finally walking. I’m starting easy. Today was just 10k with about 1000 ft elevation to the auberge at Orisson. We got supplies for picnic lunch from the Monday farmer’s market as Sieglinde and I were leaving St. Jean Pied de Port. The way was between lush green hills dotted with cows and sheep. And white farm houses with red-tiled roofs, perched on hillsides with magnificent views or nestled almost hidden in tiny valleys. To every “Bonjour Monsieur/Madame. Ça va?” to the French I passed I got such an enthusiastic “Ça va très bien!” that I believed them. They also went on to ask if today was my first day and then wished me “Buen camino”. Considering the thousands that go through here they are unbelievably patient and friendly. I watched some great hawks circling in the sky. Very seedy tiny blackberries to graze on and one fig tree with tiny flavorful fruit. Michel came along. 70, walking all the way from Le Puy. After one horrified look, he adjusted my backpack – much better. Then he gave me some tips on using walking sticks. He walks in an absolutely slow, steady regular rhythm, never breaking stride. French style he speaks loudly in your face if he thinks you don’t understand. But is so good-natured you can’t help but smile. He is one of the gems of this experience. In a day I’ve grown very fond of him. In the last kilometre who should catch up but Tony, the Australian from the train! I took one look at his pack and told him he needed to meet Michel! Who, as it turned out, was in front of the auberge as we arrived. 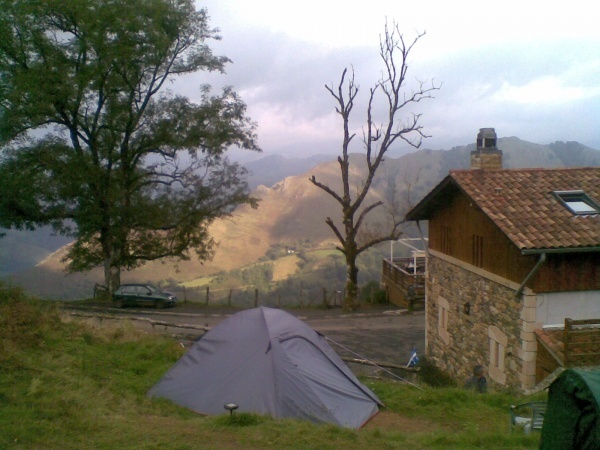 Orisson is a 16 bed & 8 tent hostel where the price includes a communal dinner and breakfast. Due to a mixup they had our reservations for last night, and they were not pleased because they had turned folks away when we didn’t turn up. Luckily, even though today there was no space inside for us, there was a tent. 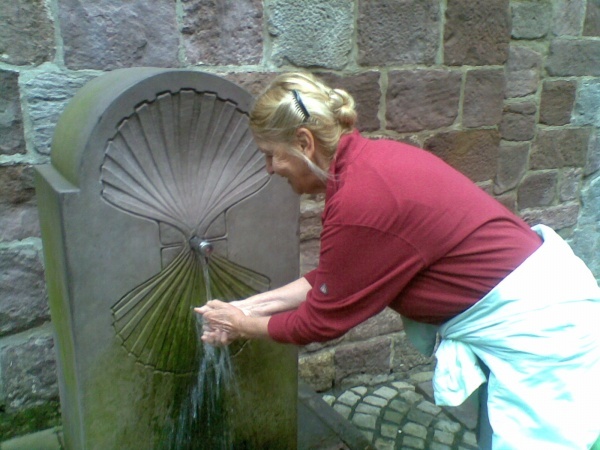 It was so nice meeting you last Sunday on our Camino Walk at the Locks – I am so enjoying reading about your travels during my lunch hours – you are an excellent story teller!